Nostalgia is powerful. The chance to catch pocket monsters in the real world saw Pokémon GO fast become a worldwide phenomenon. Oddish sprouted up in parks, Magikarp were seen splashing around near rivers and graveyards became haunted by Gastly. Those that have grown up with the brand suddenly, at long last, had the chance to live out their childhood dreams of training to be the very best on lunch breaks or when walking to work. And, in one of many other scenarios, it presented the chance for parents to introduce a whole new generation to the wonderful world of Pokémon. When Pokémon Let’s Go, Pikachu! and Pokémon Let’s Go, Eevee! were announced, the news hadn’t come as a particular surprise. The community is undeniably larger than it has ever been before, now split between those that solely play Pokémon GO, those that stick to the Nintendo 3DS (and now Nintendo Switch) games and those that dabble with both. It’s hard not to see these games as an effort to bridge those gaps, then. Not that it was ever a concern, for me at least. The Pokémon Let’s Go games reimagine Pokémon Yellow: Special Pikachu Edition, the Game Boy classic in which the electric mouse had loyally followed you around on your adventure. But now, you can choose whether to have Pikachu or Eevee as your starter Pokémon based on which copy you buy. The return to the Kanto region will challenge you to defeat the eight Gym Leaders before facing the Elite Four – disrupting Team Rocket’s plans in the region along the way. 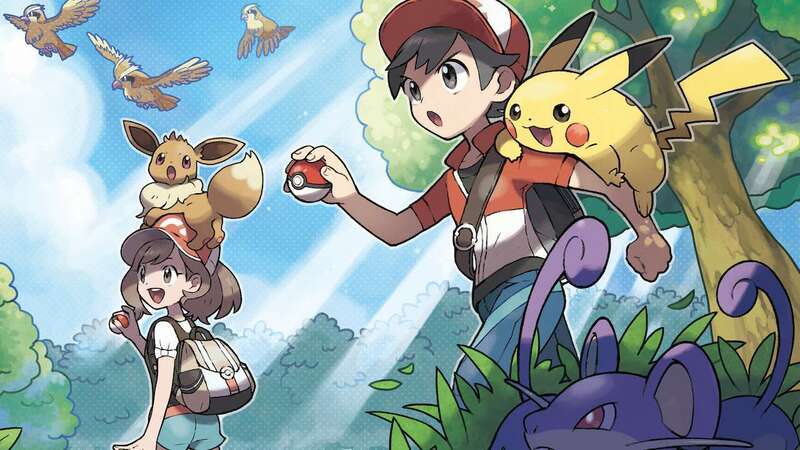 In many ways, Pokémon Let’s Go is both a perfect entry point for newcomers that will set out on their adventure from Pallet Town for the first time, as well as being a trip down memory lane for those that are returning to the region. Whether braving the darkened Rock Tunnel, climbing the unnervingly eerie Pokémon Tower or simply bumping into Jessie, James and Meowth, the world of pocket monsters that Game Freak created has never looked better than it does on Nintendo Switch. Having escaped to the Kanto region in both TV and Handheld Mode, there are few compromises to the experience based on how you choose to play. And, despite some frame rate hiccups in Handheld Mode, it was hard not to fall in love with the sun-baked landscapes all over again. That being said the way that the world has been created certainly feels far more angular than the island-hopping Alola region that we first had the chance to explore in Pokémon Sun and Pokémon Moon, but that’s not something that many will have wanted the developer to change. Although, what does look disconcertingly strange is when you notice that the many characters that you meet on your adventure can only move in straight lines and must turn at 90-degree angles before they can move again. It’s unnatural and looks out of place. But then, after longstanding issues on Nintendo 3DS, the battle animations are fluid and run much more smoothly in comparison. (At last). On the whole, it’s a strong visual start for the future of the Pokémon series on Nintendo Switch and, coupled with some resounding orchestrations of the music composed for the original game, has made me even more excited for what next year’s adventures will bring. You will want to know about what’s different and how it impacts the experience, however. There are many (admittedly divisive) changes that Game Freak has made with Pokémon Let’s Go. The most prominent is that wild battles have been removed, which, for whatever reason, I had forgotten about after running into the tall grass the first few times. In an effort to close the gap between Pokémon GO and the mainline series, the Pokémon that you can catch can be seen in the world around you and needn’t battle a Pokémon to capture it. This is where the Poké Ball Plus (or your Joy-Con) come in, an accessory that helps to make the experience feel all the more immersive. Otherwise used to move your character and work your way around menus, a built-in gyroscope means that you will make a throwing motion to hurl a Poké Ball in a wild Pokémon’s direction. As with Pokémon GO, you can use berries like the Nanab Berry to calm it down or the Razz Berry to make it easier to catch. Aside from that, you simply throw the Poké Ball and hope for the best. The inability to weaken a Pokémon or inflict a status condition is a clear step back, especially when you encounter a rare Pokémon that runs away after chomping on multiple berries and wriggling around in several Poké Balls. And even the technological marvel that the Poké Ball Plus is – with its flashing lights, playful sounds and HD Rumble – my enthusiasm for the novelty around the catching mechanics started to wane after my early hours with the game. At least Poké Balls are easy to come by, with Trainers handing some over after they are defeated and the chance to stock up at a Poké Mart, seeing as capturing is the main way that you will earn experience to raise your Pokémon. Even the motion control input can prove inconsistent. You are asked to ready your throw every time, and, once you click the Control Stick to confirm, I believe that the Poké Ball Plus locks in your position to centre itself. But, even then, you will watch in disbelief as throws that you are confident that you have hurled straight ahead fly off to the side. That inconsistency can quickly irritate, but, for those looking to play in Handheld Mode, there is an alternative and far more reliable option. With the Joy-Con attached to the console, you can either move the portable home console around or use the Left Stick to aim, to then hit the A Button to hurl a Poké Ball. It’s much more convenient, and I hope that an eventual software update could allow it as an option when playing docked in TV mode. When you eventually find yourself in battle with other Trainers, these play out exactly as before. You will need to learn type advantages and disadvantages to succeed, and, unlike Pokémon Sun and Pokémon Moon, the game won’t tell you how effective your moves are. Hold items and abilities are also out, removing layers of strategy that have been with the series some time. With many Trainers to face Pokémon Let’s Go at least poses you with enough of a challenge to overcome, even if the Kanto region restriction will mean that you will be facing the same Pokémon countless times. That increased challenge also comes from the unusual stat system, that, rather than using capped hidden values that scale with a Pokémon’s level, means that you can now use candy to power them up. These can be used to boost a specific stat regardless of their level, or, if it is candy for a particular Pokémon species, all of their stats at once. Once you start to spend time with this, you soon realise that a Pokémon can have stats that were previously impossible. For instance, I managed to boost my Level 15 Oddish to the point where I managed to beat the Level 70 Oddish that the Master Trainer has in the post-game. If you have more patience than I do, I imagine that after starting the game you could even spend time catching as many Oddish as you can on Route 1, stuff one with loads of candy and then use it to breeze your way through the game. Which seems a little unbalanced compared to normal. It’s remarkable to exist in the Kanto region again, though. While remaining true to the original game – as well as Pokémon Red, Pokémon Blue and Pokémon Green before it – the world comes to life. From the wild Pokémon that appear all around you rather than in random encounters to having the chance to ride on certain Pokémon like Arcanine and Charizard, this feels like a fresh take on the adventures that we have set out on over the past 22 years. Even your interactions with your partner Pikachu (or Eevee) help to make it feel like you have a true bond, which will reward you with the chance to use unique moves as it builds. And you can even dress your character and partner Pokémon so that they are styled the same, which, eventually, can see you both dress up in a Team Rocket outfit, among others. For those wanting to know what awaits them beyond beating the Elite Four to become Champion, the post-game is an unusual one. As in the original game, you can hunt down Mewtwo, and you also have the chance to rechallenge Gym Leaders daily. There are also the Master Trainers to defeat, who are special opponents that have chosen to focus on training only one Pokémon species. This was a fun challenge to be met with, but it soon dawned on me how much grinding it involves. The Master Trainers have trained their Pokémon to high levels, and, therefore, you will need to do the same to even stand a chance at beating them. Whether levelling with experience or hoarding candy to boost their stats, it will take far too many hours considering claiming their titles is your only reward. Even multiplayer isn’t likely to keep you occupied for long. You can participate in Single or Double Battles, or choose to trade with another player. That social aspect to the experience has been there right from the start, but, with fewer version exclusives between the two games, I can’t see that trading will be as active. I also worry that the candy-stuffed Pokémon will be overpowered in online matches, resulting in inexperienced players wondering why they are losing matches all the time. Maybe I’ll be proven wrong. There is one multiplayer option that works well. Local co-op. Simply shaking a second Poké Ball Plus or Joy-Con, a Support Trainer will appear to let another player help you to explore the Kanto region and (hopefully) win battles. They will always be the opposite gender to the main character and are restricted in that they cannot interact with anyone else, items or Pokémon. It’s support in every sense of the word, sharing your six-strong Pokémon team in battles that, more often than not, will be two-on-one. Unsurprisingly, this makes your adventure much easier, but it’s the perfect chance for more experienced players to help guide newcomers on what may be their first journey in the world of Pokémon. With more than 800 Pokémon scurrying around in tall grass and hundreds of moves to consider in battle, it’s easy to forget how daunting the Pokémon series can be for newcomers. That makes Pokémon Let’s Go, Pikachu! and Pokémon Let’s Go, Eevee! the perfect adventure for those that want to explore the Kanto region for the first time, resulting in a game that’s for everyone – whatever your age. Game Freak’s understandable pursuit of accessibility means that this journey doesn’t have everything that veteran fans have come to expect, with that lack of longevity and depth to become a sticking point. But, what counts above all else is that it is a fun and memorable experience for all.